Hello Kitty is a fictional character produced by the Japanese company Sanrio, created by Yuko Shimizu and currently designed by Yuko Yamaguchi. She is depicted as an anthropomorphic white Japanese Bobtail cat-inspired character with a red bow. 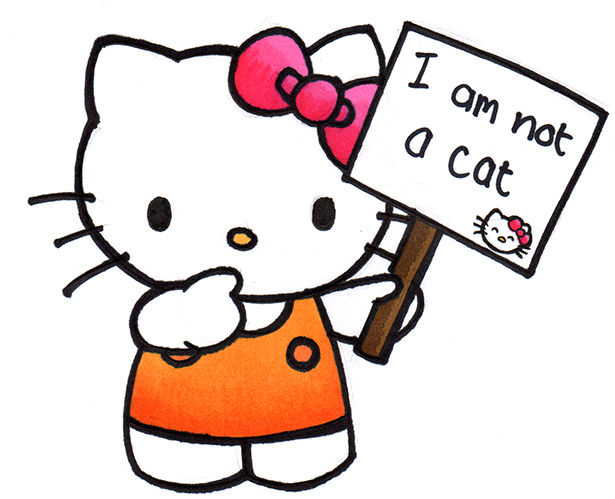 Shortly after her creation in 1974, Hello Kitty greeted the world with a "Hello!" on her first product. The Hello Kitty vinyl coin purse was introduced by Sanrio in March 1975. The character was then brought to the United States in 1976.The character is a staple of the kawaii segment of Japanese popular culture.By 2010, Sanrio had groomed Hello Kitty into a global marketing phenomenon worth $5 billion a year.By 2014, when Hello Kitty was 40 years old, she was worth about $7 billion a year, all without advertising except on Sanrio's, related show producers', and ticket sales' webpages and at show venues and nearby locations. She can be found on a variety of products ranging from school supplies to fashion accessories and high-end consumer products. Including various diamond necklaces. Several Hello Kitty TV series, targeted towards children, have been produced. Hello Kitty is also the main character at the two Japanese Sanrio theme parks, Harmonyland and the indoor Sanrio Puroland. We have many toys of kitties and specially in sale this week. please visit our store @875 SPIROS in Dekalb.